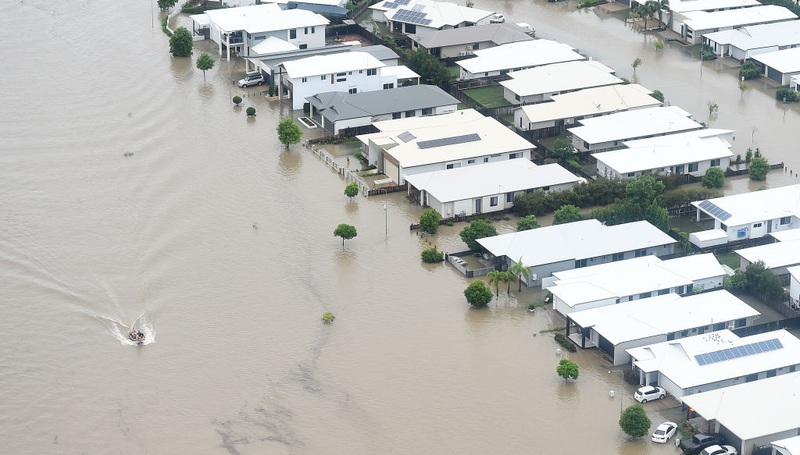 Two men are missing and more torrential rain has fallen on flood-stricken Townsville in northern Queensland, sparking fresh emergency alerts in four communities. Water levels are finally subsiding in some hard-hit suburbs, including Idalia, where Prime Minister Scott Morrison has been meeting with flood victims today. Residents of Bluewater, Bluewater Park, Toolakea Beach and Saunders Beach were warned about flash flooding and told to get to higher ground. But authorities were grateful the rain missed the swollen catchment of the Ross River Dam, which had to release an unprecedented amount of water earlier this week. Residents have told how torrents of water swept through their homes after spill gates were fully opened when the dam hit its peak. The dam has now receded, but Townsville Mayor Jenny Hill warns the city is not yet out of the woods despite the weather system moving slowly southwards. "We are hearing from the Bureau of Meteorology that it could trip north again so we are asking people to remain vigilant," she has warned. Swift-water rescue crews had to rescue a man from the roof of his car at Bluewater overnight, after his car was swept away. Police are still searching for two men, Hughie Morton (21) and Troy Mathieson (23) who were last seen on Monday morning near flood waters in the Townsville suburb of Aitkenvale. More than 1000 people remain holed up in evacuation centres and authorities are waiting to inspect hard-hit suburbs to determine how many homes and businesses have flooded. The current estimate of 500 is expected to rise dramatically. The effects of the trough are still being felt west of Townsville, and to the city's south as it travels down the coast. Communities as far south as Mackay and Sarina have been warned to expect damaging winds and heavy rain today. Falls of up to 200mm are possible in six hours, with the possibility of 300mm in concentrated areas, driven by bands of storms. Out west, heavy rain that could cause flash flooding is likely to continue. Julia Creek, Richmond and Winton, which have already seen heavy rain in recent days, could be affected. At Charters Towers, west of Townsville, floodwaters have cut major road routes, and an enormous sink hole has opened up on the Laroona Ewan Rd, off Hervey Range Rd. Dramatic drone footage has emerged of the Burdekin River in flood, the landscape covered in a vast sea of brown water. Premier Annastacia Palaszczuk has warned the damage bill could reach into the hundreds of millions of dollars. She's expected to provide an update on the flood situation today. If you have a dam that you have to 'spill' in the time of Climate Change, a restructure is needed. This is a disaster. People must come first.